You’ll pardon my having disappeared for awhile. I have been deep into hazelnuts. It’s what you do as you must when you make a hazelnut biscotti. My Hazelnut biscotti may be the most dependable baker of the three biscotti we make at Benish's Bakery, but it is not undemanding. It requires wonderful ingredients, from fine Madagascar vanilla to rich, dark rum to fresh eggs and organic flour. It also demands lovely hazelnuts for roasting. For years, the Turkish hazelnut was both plentiful and dependable. Their blanched hazelnut was pretty and toasted to a deep brown and gave you that ubiquitous roasted hazelnut flavor. Turkey produced about 3/4ths of the world’s supply...until suddenly they didn’t. "Suddenly" came In 2014. It was beyond anything that could have been imagined. A late frost took out over half their production just about the time the hazelnut spread Nutella and its cousins went ballistic in popularity. Supply couldn’t meet demand. Prices soared. Quality became unreliable. Quality is always relative with hazelnuts. In the best of times, you must pick and sort before and after toasting to remove the odd shrunken, misshapen, and stale ones that over-brown. After the frost wrecked the world’s supply, I had to spend more time, accept more loss, and occasionally return entire boxes of them. Meanwhile, the price soared - no matter the quality. Recently I had to return two boxes of them and scramble to find an emergency supply. And after that I decided I could no longer count on Turkish hazelnuts and had to see if a more permanent substitute was available. I had sampled Oregon hazelnuts in the past. The difficulty was finding a supplier of quality hazelnuts that can supply them year round and who sells larger amounts than one pound bags but more modest quantities than a ton. The Oregon hazelnut distribution system is developing as their harvests increase. These hazelnuts are also getting more attention because of the trouble with Turkish hazelnuts and the expanding demand worldwide. The Oregonians have also been developing new varieties through their state ag department. I was sent samples by one supplier I contacted of both raw and roasted hazelnuts. They were of the relatively new Sacajewea variety. Trees planted in the past decade are just beginning to produce in sufficient quantities to be commercially sold. The raw turned out to be marvelous if a bit more trouble. They require skinning after roasting - rubbing to loosen and discard as much of their skins as possible. But the flavor is worth it. The Sacajewea variety has more natural sweetness and fewer of the sharp, higher notes. The sweetness is amplified by toasting. The flavor is slightly softer and richer. No one wishes to have supply problems. 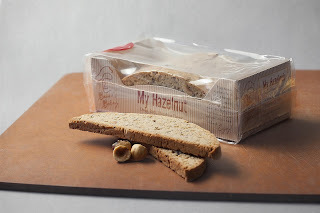 But this once, a shortage of Turkish hazelnuts took me on a journey which ended with a better hazelnut for my biscotti. The hazelnut shortage is not over. The love of spreads like Nutella will continue to press supply, elevate prices and result in shortages when weather affects crops in Turkey and elsewhere. But production in Oregon is growing and should help keep My Hazelnut a sweet treat for you to enjoy in the years ahead. Brioche is not the bread I’d start with, but I am ever so happy to have gotten to the point of regularly making it. It is demanding and magical. It is rewarding even as you are learning. And you are always learning. Every week as I make the dough, I marvel. Who could have imagined this in the first place? So much butter and egg in a bread! 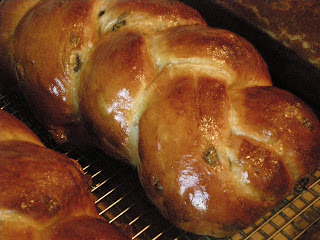 Because there is so much, many consider it a pastry rather than a bread dough. And it can be used for pastries. It recently became the base of trendy and pricey doughnuts. It certainly has the pedigree, the ingredients and the work required to have such a special place. Brioche developed in France over at least the last seven centuries, gradually becoming richer as the levels of butter and egg increased. 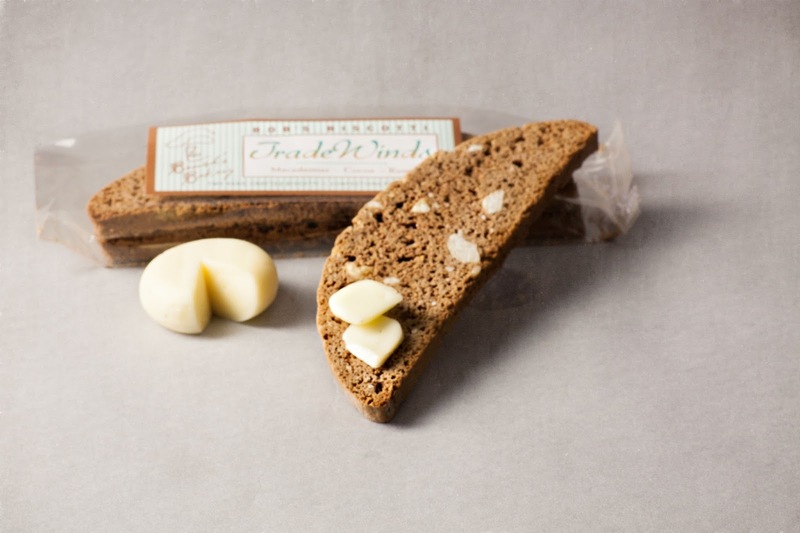 It was the “blessed bread” of the church in France then became the favorite of the aristocracy. Just after America’s Revolutionary War, when the French peasants were starving and rioting because they could get no bread, one princess is said to have suggested, “Let them eat brioche.” It was translated to, “Let them eat cake.” And no, it was not said by Marie Antoinette. But brioche really is an aristocrat of breads. You start with either milk or water along with the yeast, sugar, salt and less than half your flour. It’s a gloppy mess, about the consistency of a sticky pudding. To this you patiently beat in the butter, the egg and the rest of the bread flour. There’s almost as much egg as water and almost as much butter as egg. And as you alternately add the egg and flour to complete the dough, it comes together. As you knead it, the dough becomes elastic and begins to pull away from and “clean” the sides of the bowl. And this is only the beginning of the preparation. It has to be allowed to rise, punched down, then refrigerated and allowed to rise again overnight before being briefly kneaded, portioned, shaped into loaves or buns or whatever it is to become then allowed to rise yet again. During this final rising, the loaves are brushed with an egg/milk wash three times. It is worth all your work. As the aroma comes from the oven, it is intoxicating. When it is pulled from the oven, you see the bright brown sheen the brushing with egg and milk created and you smell all the goodness that has gone into it. It almost begs to be eaten. Brioche teaches you about a cooler beginning and slower rise. The flour mellows. The braids have more strength. The loaves hold their shape and have better definition. It is a happier bread. It practically begs you to set a bit of dough aside to try something new. Brioche teaches patience from beginning to end. You get faster as you go along because you learn the right consistency for the butter - soft but not mushy, learn the developing textures, learn to take the time to fully incorporate the butter and egg and flour with each addition, learn to love a slower rise for the texture of the finished bread. It is not so different from other breads in wanting you to wait until it is ready. It just has so many more steps as you build the dough. Every step given the proper time makes the next step easier and quicker while hurrying through one makes the next step take longer. If you plan to make brioche, you must allow about two hours from beginning the prep to the time you put finished dough into a bowl or tub to let it rise the first time. But the next morning, when you take it from the fridge then shape your loaves, let them rise, then bake them, the reward is amazing. Your patience is rewarded many times over. As with so much in life, patience is the first tool of baking. Without it, you can’t be a happy baker. Be happy. Take your time. 6: Great "Instant" Hot Chocolate! As I write, the temperature is zero. The sun hasn’t even begun to tint the darkness with shades of deep purple. And my mind immediately turns to my father’s fabulously easy hot chocolate recipe which can be made by the mugful. You'll need nothing more than boiling water, a mug, a spoon for mixing and stirring, and the right ingredients. You will probably need to get the heavy (whipping) cream. You may also need Dutch type cocoa. This recipe is an inheritance from a man for whom food was a way of life. He grew up in the restaurant business in St. Louis, He gave the same gift to his family he was given - a belief in the joys of herbs and spices, honest ingredients, gas flames, and time to let the fire work its ways. Fortunately, his hot chocolate requires little time, only a kettle on the stove, and less mess than just about any recipe I can think of. It can be made by the mugful as you ready to curl up with a blanket and book, or by the pitcher for a family gathered in the living room for the warmth of a fire in the hearth. Sugar, Dutch style cocoa, heavy cream, salt, boiling water. The optional ingredients are vanilla, booze and other flavorings of choice, (such as peppermint for kids.) You will also need a mug and spoon. Stir from the bottom to fully blend. This is also where you can add a shot of rum or Gran Marnier or whatever suits you. For best results, preheat the mug with some of the boiling water then dry thoroughly before mixing. For a pitcherful, you can warm the pitcher and mugs in a low oven. I will also recommend using pasteurized rather than ultra-pasteurized cream. The pasteurized has better flavor than the ultra-pasteurized version. It also whips better. As to something to accompany the hot chocolate, I’m partial to My Hazelnut. But the spices and cocoa baked into Trade Winds is a tough pairing to fault. 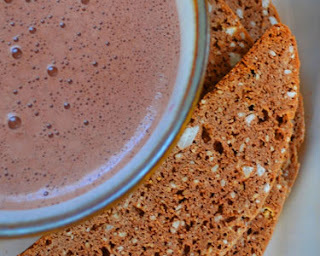 The richness of the biscotti and cocoa is just what’s needed to take the edge off the chill this winter morning in this new year. So from my father to you, hot chocolate that’s about as easy as “instant” and so much better. Real ingredients to make a sweet indulgence a body needs on a bitter cold morning. Let me know how you like Poppa Bob’s hot chocolate. And don’t be afraid to steal the recipe and make it your own family tradition. Oh, vanilla! It is one of the lovelier sets of flavors and aromas the world has been given. And what we go through to have it. Europeans found vanilla already prized in the “New World” upon their arrival. It comes from the seed pods of the vanilla orchid, V. planifolia. In the 1520s, Cortes sent vanilla back to the “Old World” and Europeans were given a taste of this treasure. Cultivation outside it’s native land would take just over three centuries. The orchid first flowered in Europe in 1806. Cuttings from that plant were shared in Europe and the French soon sent it to their colonies. But pollination of the short-lived flowers was a problem. The flowers don’t self-pollinate naturally, a flap keeps most bees out of the flower, and the bee that lifted the flap and pollinated the orchid flower so well in Mexico for centuries didn’t travel. That meant hand-pollination would be required to produce a crop. And that wasn’t easy. In 1841, a 12 year old slave, Edmond Albius, on the island of Reunion found a method still in use today. Using a beveled sliver of bamboo, the flower’s flap is lifted and the thumb is then used to transfer the pollen. It’s the first of many labor intensive steps in growing then curing the seed pods from which we get vanilla. Three major varieties can be obtained today: Bourbon or Bourbon-Madagascar, Mexican, and Tahitian. All have gotten exceedingly pricey - a gallon going for about 500 dollars as 2018 approaches. But one cannot substitute the artificial. Trust me, it’s a high, thin flavor. It’s not the same in any but the most superficial, rather annoying way. It lacks depth and warmth and all the little side notes of the real vanillas. You may have noticed in looking at the ingredients that go into Trade Winds I chose to use Tahitian vanilla. To me, the flowery, higher notes it possesses perfectly matched the spice cookie I envisioned. But “flowery” and “rich” and “warm” and all the other words to describe the complexities that come from vanilla are not the way I differentiate the three vanillas. To me, they are like lovers. Tahitian is like first love, tentative and fragile yet intense and sure. It has excitement and energy. It’s Romeo and Juliet - hold the suicide. Madagascar is the married couple, still passionate, holding hands, exchanging knowing looks. Solid and dependable, yes. But ever-so romantic at heart. Mexican is the pair in the midst of an affair. It is the soul of passion, a transcendent warmth that commands the moment. It is pure romance. I’m lucky to have a source for all three major varieties of vanilla: The Vanilla Company, https://www.vanillaqueen.com. The owner, the Vanilla Queen Patricia Rain, works to help small growers and processors around the world begin and maintain production. And she provides pure vanillas for bakers like me to use and you to enjoy. And I don’t just enjoy vanilla. I love them all. I love having them around just for their fragrances. They are one of the joys of being a baker. 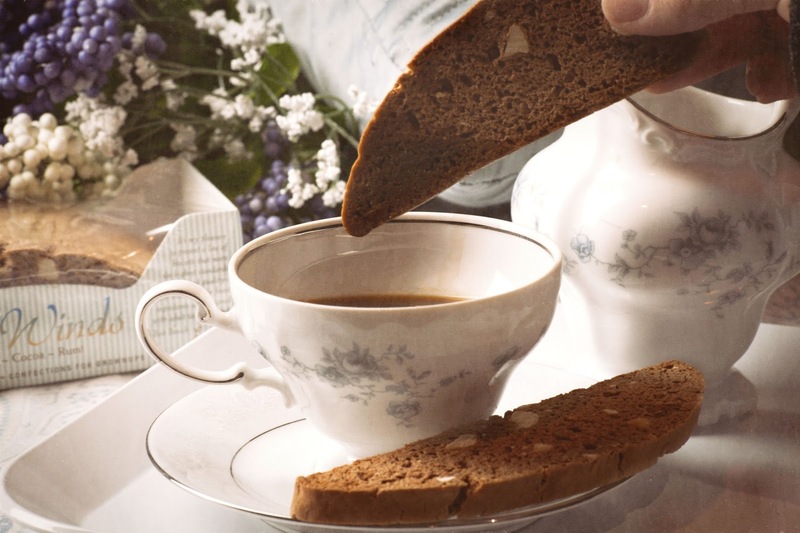 I hope you enjoy my sharing my thoughts about baking and enjoy my biscotti - my craft. Feel free to log in and comment or ask questions. I look forward to hearing from you. After the battles I had creating The Citrus and My Hazelnut, I should have been wary about what would happen with the third of the three biscotti I envisioned. I wasn’t. I can’t say with any certainty why I wasn’t, but I suspect it was the focus I had on what was becoming my “family” of cookies. I knew my first two children. I would learn to know them better, but I didn’t know how much I had yet to learn about them so I was filled with confidence. And my imagination was bursting with what I envisioned the final biscotto to be. It would have a base much like that of The Citrus with flour and almond flour and white chocolate. But it would be a spice cookie at heart, a spice cookie in the European tradition. It would have the cocoa My Hazelnut had rejected, it would have spices, it would get the more flowery Tahitian vanilla and dark rum. And it would be studded with macadamias. It had taken shape perfectly in my mind. All that remained was to bring it to life and to give it a name. And so, I sketched out the ingredients. I mixed, shaped and baked. I rested the loaf, sliced then dried the slices. Then tasted. And my third biscotti was almost there. The blending of the spices was ever so close. All it took was a slight adjustment for the second test. I never needed a third. I gave it the name Trade Winds to reflect the spices and Tahitian vanilla, the cocoa and macadamias and rum - all flavors of the trade route. It was the easy child. It had come together quickly. It was less finicky in the bake than The Citrus but not quite as easygoing as My Hazelnut. It filled out the flavors I wanted to make. It completed the “family” of biscotti. Oh, there would be tiny changes to all the three biscotti as I found the right temperature, the right way to mix, the right balance of flour and egg, adjusted the temperature to the adjusted texture then made more small changes. These small changes occurred over the course of a few years as I worked to get more uniformity from each bake. This is what happened as my children “grew up”. Now they are grown. Now the only change is the slight adjustment of the amount of egg used to compensate for the weather and seasons of the year - the heat, the cold, the damp or dry conditions - what would be half-a-teaspoon or less for a single loaf you might make at home. And now, the only thing that can keep my biscotti from being the beautiful cookies they grew into is the arrogance, foolishness or plain stupidity of the baker. It’s what we humans are heir to. I’ll tell you some of the foolishness I’ve experienced and lessons learned as this writing continues in the weeks and months to come. I hope you’ll follow my blog and give me your feedback. When you buy my biscotti, I know my baking is making your tastebuds happy. When you follow my writing, I know my words are satisfying your mind. And three very different children they turned out to be. The Citrus was the first child. She turned out to be my teacher, even though I had no idea this was to be part of her personality. I understood the biscotti would have different flavors…and slightly different textures from the differences in ingredients, but I had no sense of how different their personalities could be. 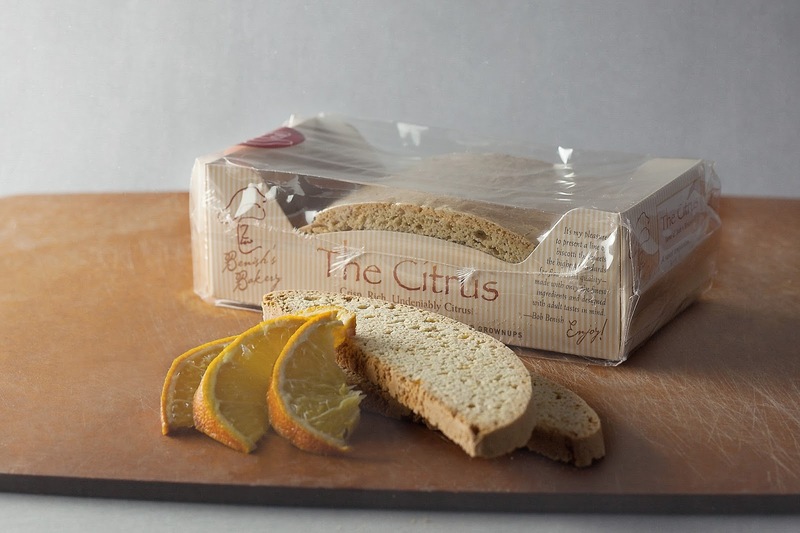 If The Citrus was my teacher, the hazelnut biscotti was the stubborn child and a good deal more after we came to terms. The problem began with the belief I was going to make was a cocoa-hazelnut biscotti. I could imagine the flavor combination. The biscotti couldn’t. The hazelnut and cocoa didn’t want to be friends. They both wanted to be king. When hazelnut ruled, the cocoa faded away. Let cocoa reign and hazelnut retreated into a corner. Even using small amounts to barely change the balance, cutting the change in half then in half again didn’t get the hazelnut and cocoa to a common ground. My preconceived vision had been beautiful. And beautifully wrong. If I was going to make a hazelnut biscotti, hazelnut demanded top billing. He was to be the star. Cocoa needed to find someplace else to hang out. But hazelnut now needed a proper supporting cast. I gave it extra low notes to compliment the richness of toasted hazelnuts and hazelnut oil and soften the higher notes of the hazelnut flour. Large doses of dark rum and Madagascar vanilla were paired with only a hint of spices and a dash of orange zest and oil. It became what it had demanded to be, a biscotto which has a butterscotch undertone that melds with roasted hazelnuts. It became “My Hazelnut” and my second “child”. My Hazelnut is not without its simple demands. The hazelnuts must be sorted, particularly after toasting. Shrunken, shriveled, oily looking ones and those that have darkened excessively must be discarded. It also asks me to remember to follow the recipe - remember to get the ingredients in, to add them in proper order, to take the time to fully mix them, to scrape the bowl and beater as needed, get the temperatures and times right - to be a proper baker. It’s not a lot to ask when coming from such a well-behaved child. * The oil also makes “My Hazelnut” the most susceptible to humidity. For me, that means packaging can’t be put off. For you, it means keeping the unused biscotti in a zip-type bag gets an asterisk, particularly in muggy weather. If the biscotti stay out too long and lose their snap, re-crisp on a wire rack at 200 degrees for seven to ten minutes. Remove from the oven. Allow to cool before storing airtight. I don’t know how it is for others when they adapt and create recipes. For me, it comes down to focus. You concentrate on what your taste buds have to tell you. You wait for the little flavors to appear below and behind the dominant ones. You hold onto the aromas until they almost disappear. You smell to learn the way they change. You do it again and again. Somewhere in the back of your brain is the biscotti you imagine you’re going to make. The scents, the tastes tell you where you are. They point you toward your imaginary destination. Sometimes they lead you down a dead end and you have to backtrack. But they always lead you onward. What The Citrus had to be was ‘burstingly’ citrus. What she wouldn’t become was citrusy enough using lemon and orange juices. They give lovely notes. But they were lovely modest notes. They had to dominate. In her brilliant book, “In the Sweet Kitchen”, Dana Regan praised citrus oils for their ability to impart flavor and aroma - to give a citrusy ‘oomph’. As an amateur baker, I’d never played with lemon or orange oil. They’re not commonly offered in groceries. You have to go looking. I did. What a revelation. I tried the oils, using ¼ tsp per cup of liquid. Wherever that advice came from, it was short. * But the flavor was zesty and bright even though it was not insistent. I tripled the amount, something Chef Regan recommends as a general rule in baking. This was the birth of the The Citrus. It finally had a bold enough flavor and aroma of lemon and orange to play with other flavorings - the accents that add interest and subtle complexity. Orange juice gave the biscotti a flavor similar to “Dreamsicles”. It thrilled my mother-in-law. I liked it too. But it didn’t match my imagined creation. It dimmed the brightness. Cognac didn’t. It lifted and accentuated the citrus. And spices with higher notes like cardamom and ginger contributed to the flavor rather than competing. From there, it came down to balancing the flavors, adjusting them to hone in on the compromise of what my imagination had begun with and what The Citrus was becoming. This was the actual beginning of Bob’s Biscotti - learning to let it tell me what it was capable of being. The Citrus was my teacher. She remains so, more demanding in the mixing, more finicky in the baking, more exacting in the drying. Even after ten years, The Citrus is always ready to remind me how human and fallible I am. And you have to love a wonderful teacher. Thanks for being here. I hope you’ll take the time to comment and give my biscotti a review if you’d like. I look forward to your being here again. • Boyajian, the maker of the oils I now use recommends adding another ½ tsp per cup of dry ingredients. If I’d had their recommendation at the start, I would have begun closer to the needed amount. But the process I went through was what it was and led to the biscotti I make.